One of the things that made me want to buy my Huxley was its ability to print without a computer attached. Of course it still needs a computer to start the print – but once it is printing it can be left alone to finish. I have just brought a kit from think3dprint3d that should change that completely. 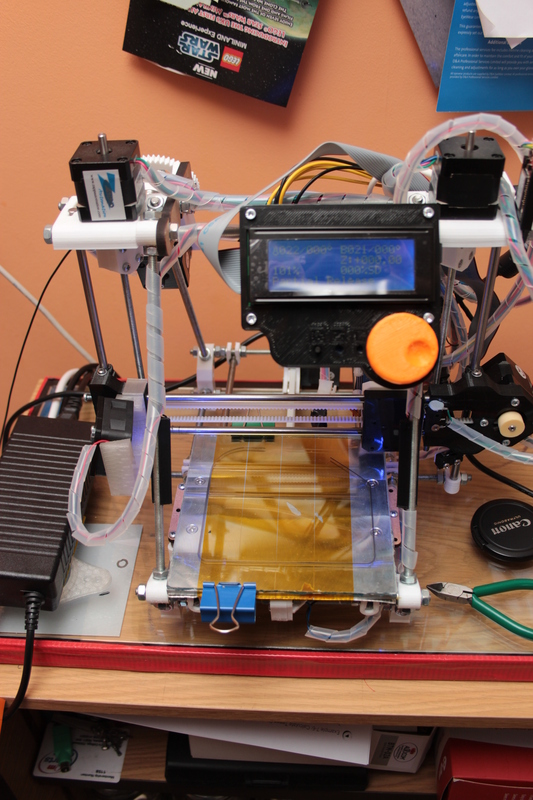 They produce a kit that will fit on the Sanguinololu and enable it for total autonomous printing. 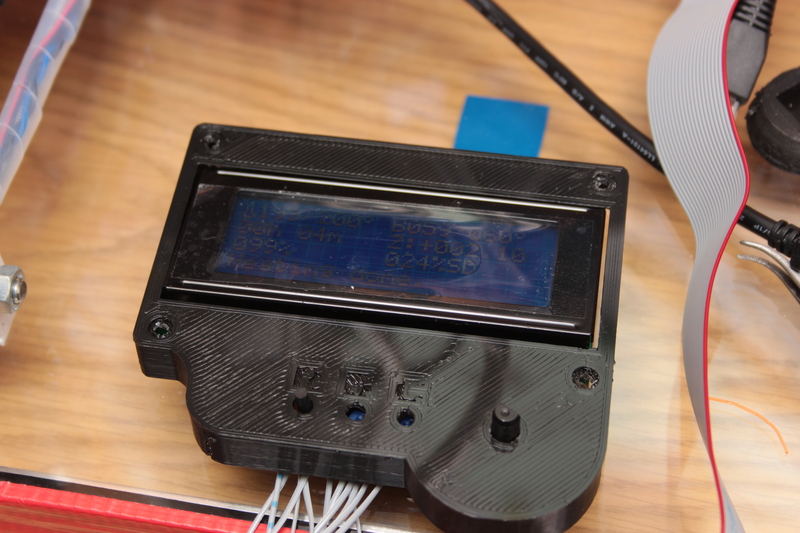 The first thing that is needed for self actuated printing is a display – obviously without that there is no way to see what you are choosing to print. The next thing is some way to interact with the system. In this case it is a rotary encoder and push switch combination. Lastly there is the SD card reader that I already have. In the kit is the display, rotary encoder, two pots (one for LCD contrast the other for LCD backlight), one push switch for reset and connectors and wires. Not included in what I brought is the SD card reader as I already have that – although there is another kit which does include it. 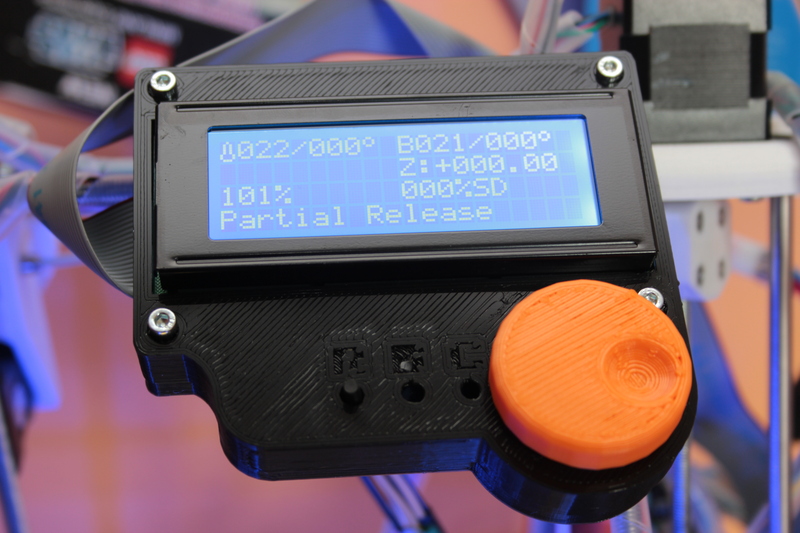 The only thing that you need to provide yourself is the case which is available on Thingiverse to print out. As I final thing to check off on the list is that the firmware in the printer needs to be Marlin rather then the default Sprinter. Marlin cannot fit on the 644p that is supplied with the Sanguinololu so you will have to get a 1284p instead. Again, having tried to play with Marlin in the past I already have that chip. Marlin is a great upgrade – I won’t go into all that it offers here but suffice to say that is much more advanced than the version of Sprinter supplied with Huxley. You may have noticed that I said I had played with Marlin in the past. When I had originally tried Marlin it wouldn’t maintain the temperature of the hot end. Since I have put on V 1.0 RC2 it maintains the temperature perfectly – mostly within about 0.5C. The kit contains all the you will need to make the panel with the exception of the case. However all is not lost there is a link to a case designed by them on Thingiverse – so if you have a RepRap that is of the triangular frame it should fit just fine. There is even a choice of left or right hanging. The fiddly part of the kit is getting all of the sockets wired up. If you don’t have a tool that can make a professional job of crimping the connectors then you will need to bodge it. I followed Nophead’s YouTube video. Another thing in the instructions that isn’t clear is how long the wires need to be inside the case. They suggest that it is ‘at least’ 10cm. If – like me – you overestimate (by approx 5 cm in my case) you will have to try and squeeze in all the cables. This could lead to pinching one or more wires and potentially causing a headache sorting it out. I would say that you only really need to have the cables 10cm from the other side of the SD holder. One of the great things of Marlin is that it supports directories on the SD card. If you plan to do a lot of printing away from a computer of the same items then it could be useful to sort the files in directories. The display in ‘Watch’ mode. Shows the current state of the printer. The kit went together well – if sometimes a little fiddly and the occasional cloudy instruction. It does what it says it will do and works really really well. I love that I can now just pick up my printer – take it where I want and print. All without the computer. Of course you still need a PC to slice the models, but the printing can now be totally autonomous.